At the start of Euro 2016 few would have given Portugal much chance of success in the tournament, even fewer after they scraped through the group stages without recording a victory. In their final group game they were forced to come from behind three times against Hungary with two goals coming from the mercurial Cristiano Ronaldo ensuring that they just did enough to reach the knockout stage. Euro 2016 was expanded from 16 to 24 teams, with 16 making it through to the knock out stage; but if everyone thought that the smaller and unfancied nations were in France just for the ride, Euro 2016 served up its fair share of surprises with Wales deservedly progressing to the semi-finals; Iceland pulling off a major shock by eliminating England, whilst the unfancied Hungarians reaching the round of 16 after finishing their group in first place ahead of eventual winners Portugal. 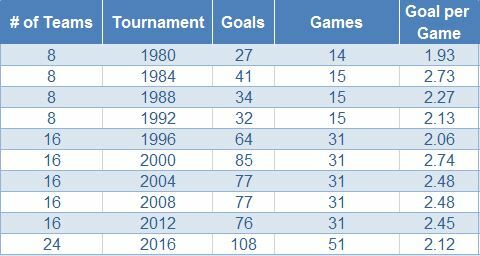 In this month’s newsletter SportsMatrix looked back over the tournament to see the effect of increasing the number of teams from 16 to 24, in terms of the performances of those extra eight teams and in the average number of goals scored per game since 1980 when a group stage was introduced. We also looked back at Portugal’s performance, comparing it with that of previous winners of the European Championship since 1980. Did the extra eight nations add any value to Euro 2016? Before looking at the performances of the additional eight teams, it was first necessary to establish which of the teams which made it to Euro 2016 wouldn’t have qualified based on the same criteria that existed for Euro 2012. In both Euro 2012 and Euro 2016 the top teams in each of the nine groups automatically qualified, with only the best second placed team automatically qualifying for Euro 2012, whilst the other eight second placed teams were drawn into a two legged playoff tie. Since most groups had six teams and others five, so the results against the bottom team in six team groups were expunged. All other teams, including all third placed teams were automatically eliminated in Euro 2012. If this method was applied to Euro 2016, Turkey, Ukraine, Sweden, the Republic of Ireland and Hungary, all of whom finished third would not have qualified for the tournament; along with Albania, Croatia and Wales who finished their qualifying groups in second place. Of the eight qualifiers, Albania and Wales were making their first appearances in the finals of a European Championship, with Wales having previously reached the World Cup finals in 1958. Four of these eight teams progressed to the knockout stage of the tournament, with Wales, Croatia and Hungary winning their groups, whilst the Republic of Ireland qualified as the second best third placed team. Of those who fell at the first hurdle, Turkey and Albania finished third in their groups, narrowly failing to qualify, with Sweden and Ukraine finishing last. Of the four teams to progress, three fell in the round of 16, with Croatia eliminated by the eventual winners Portugal after extra-time; Hungary were soundly beaten by Belgium and the Republic of Ireland eliminated by hosts France after leading the game at half-time. The fourth team, Wales overcame a much fancied Belgium team at the quarter-final stage, before eventually losing out to Portugal in the semi-final. How has the increase to 24 clubs affected the number of goals scored at Euro 2016? After averaging close to 2.5 goals per game in the last three competitions, Euro 2016 saw a significant decline with on average 2.12 goals scored per game. There has been much discussion as to the cause of this decline with a number of possible reasons put forward. Perhaps a possible reason is that with the top two teams and four of the six third placed nations automatically qualifying for the knockout stage, teams felt confident enough that they could pick up enough points by defending solidly and looking for a solitary goal. Both Germany and Poland qualified without conceding a goal, whilst France, Switzerland and Italy all qualified having conceded a single goal. Up to 1976 with only four clubs taking part, the European Championship was a straight knock-out competition, but in 1980 the competition was expanded to eight clubs, with two groups of four teams, with the top team in each group playing in the final. The average number of goals scored in that first competition (1.93 per game) was the lowest of any subsequent competition; but four years later, with the same number of teams, but a slightly amended format, the number of goals per game shot up to 2.73, the second highest average of any subsequent European Championship. The average number of goals scored in the next two competitions fell, but remained above the 1980 level. The average number of goals scored per game during the European Championships between 1980 and 1992, with eight nations taking part averaged 2.27 goals. In 1996 UEFA doubled the number of teams taking part from eight to 16 and just as in 1980 the average number of goals per game fell to its lowest level (2.06). But once again history repeated itself with the second tournament after the increase in teams showing a huge increase, with on average 2.74 goals scored per game, the highest number since the competition was played in its present format. The average number of goals scored in the subsequent three competitions has fallen, although not by a large amount, with the average number of goals scored in five European Championships to 2012, played by 16 teams averaging 2.45 goals per game. As in previous occasions when the competition has expanded, Euro 2016 has once again seen a decline in the average number of goals scored per game, with 2.12 representing the lowest number since 1996. It may be purely coincidental but on each of the three occasions that there has been an increase in the number of teams participating in the European Championship the average number of goals scored has fallen significantly over previous tournaments; but in the subsequent tournament there has been a record increase in the average number of goals scored. If this trend continues then Euro 2020 which will take place in 13 different venues from as far west as Ireland to as far east as Azerbaijan, promises to deliver a record number of goals. How did Portugal perform in comparison to previous European Champions? Euro 2016 was the first tournament in which a third placed team could progress to the knock out stage of the tournament. It was also the first time in which a team finished third in their group and yet still went onto win the tournament. We examined the group stage performances of all previous winners of the European Championship going back to 1980 when it was played in its present league structure. Timing is important and putting in peak performances at the right time is often the key to winning a tournament. In Portugal’s case this was clearly shown during Euro 2016, with their performances steadily improving as the tournament progressed. Portugal’s group stage performance in 2016 ranks as the worst of any previous winner and is the only time that the eventual champion failed to win a group game. Whilst the number of goals Portugal scored in the group stage was slightly below average, they conceded the equal highest number of goals in the group stages of any previous winner. Portugal played seven games during Euro 2016, the most of any previous European champion, with their 2-0 victory over Wales being the only game in which they beat an opponent without requiring extra time or penalty kicks. During the entire competition Portugal lead their opponents for a total of only 73 minutes.